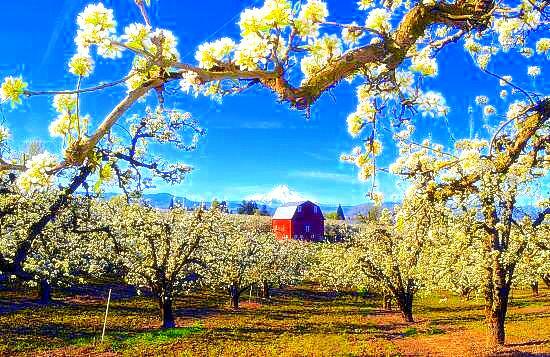 looking over miles of the Hood River Valley come into bloom. She is beautiful in Spring as a Mexican girl dressed for her wedding. there is always this laughter! Today I climb in fog and middle 50’s, clouds with their arms all around me. is balanced by an equal certainty, I can fly. From where I sit now I can choose the world I live in. If I fall from here, the result will be the same. I see the languid body of our Lord uncoiling from sheets of sky. Hear the river praising itself over rocks worn smooth with laughter. The shallower the water, the louder is its praise. There is no difference between falling and flying. The wheat deserts say that everything in this world is a door. To fall is one door. To fly is another. this is a third kind of door. there is a staircase spiraling into quiet. There is an emptiness inside the bone I have learned to walk through. Now I can say, I am completely alone, or I can say I walk hand in hand with my Lord. as long as I will pay the price this world insists upon. The first step away from selfishness is a falling that gives us wings. so the head may fall of its own weight to rest over the beating heart. not in the closed but in the open, empty hand. Then our faces shine like spoons full of water. We are gathered into someone’s arms whose only name is Silence. but I don’t look for meaning in this light. the name that is yours alone in whom I am harvested in Fall. I am climbing down this ladder to my sons.